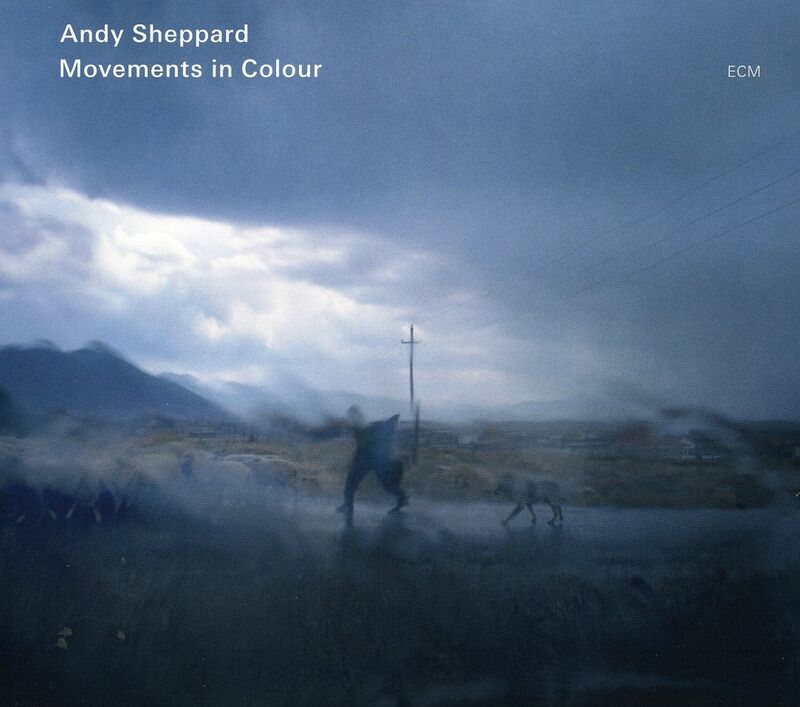 British saxophonist Andy Sheppard’s ECM debut is a phenomenon in sound. A musician of remarkable integrity, Sheppard takes full advantage of the opportunity to broaden his reach farther than ever before. For this project, he indulges in his Indian, African, and Latin affinities, as reflected in the eclectic lineup that shapes this set into something greater than the sum of its parts. Guitarists John Parricelli (last heard on Kenny Wheeler’s A Long Time Ago) and Eivind Aarset weave acoustic and electronic impulses into a yielding web of support throughout; Arild Andersen, a bassist who can do no wrong, brings melodic heft to what might otherwise have been a supporting role; and tabla master Kuljit Bhamra makes his only ECM appearance in a fine showing of percussive breadth. Sheppard himself likens Movements in Colour to a dream made realizable only through the fit of its talent. In this respect, Bhamra is a revelation. Encounters with tabla in a jazz context are sure to inspire memories of Collin Walcott’s all-too-short career, but here the results are more akin to Charles Lloyd’s powerful Sangam trio with Eric Harland and Zakir Hussain. Bhamra’s entrance in the 15-minute opener “La Tristesse Du Roi” touches off an intimate symphony, more figural than instrumental. Light-footed yet secure, his stitching keeps the sky from blowing away like a cloth in a cosmic sneeze. Gorgeous bassing and keening electric guitar add a dual coat of ash and flame to the eggshell of this freshly hatched bird. Andersen stands out early on, tracing our ears as would a master painter lay down the underdrawing. His contributions continue to shine as fully embodied images, even from beneath the layers of Sheppard’s melodic gifts. The album’s compositions—fully Sheppard originals—are its lifeblood. “Bing” is a particularly luminescent example. Bhamra and Sheppard play beautifully off each other, while Parricelli adds cosmic sheen. Ghosts of influence haunt this and other tunes. One might trace lines of flight back to Jan Garbarek, whose muscled lyricism echoes in “Nave Nave Moe” and “May Song,” although the music is quintessentially Sheppard’s own. Deeper contacts abound in “Ballarina,” which by virtue of its shaded, waltzing comportment sounds like a Paul Motian sketch. The final two tracks of the disc, “We Shall Not Go To Market Today” and “International Blue,” give offering to land and sky, respectively. Where one is a patch of sunlight on misty canvas, thus hinting at spring thaw with its celebratory undercurrent, the other floats Sheppard’s insights over Aarset’s wash of electricity. Andersen gives foothold throughout, indicating only barely the wistfulness of things. Affirmative and healing, Movements in Colour is a collect call from the ether. Sheppard’s virtuosity is such that one hardly feels the focus and effort required to translate the messages thereof. His mastery of the saxophone’s periphery in particular breathes like the rest of us, singing even as it speaks. By far one of ECM’s best of the new millennium.